The official version, the conspiracy theories and the evidence surrounding the collapse of World Trade Centre 7 on September 11. Is Tower 7 the first skyscraper to collapse due to fire? Was there anything suspicious about Tower 7? What is the official explanation? How much fire was there in Tower 7? Why has the final report into Tower 7 still not been published? Was Tower 7 deliberately destroyed by explosives? Was an incendiary used to demolish Tower 7? Was the owner part of a conspiracy? Was the media part of a conspiracy? Did anyone die in the collapse of Tower 7? Is Tower 7 the first skyscraper in the world to collapse due to fire? If the official account is right then the 47 storey World Trade Centre 7 building is the first and only steel framed skyscraper in the world to have collapsed because of fire. 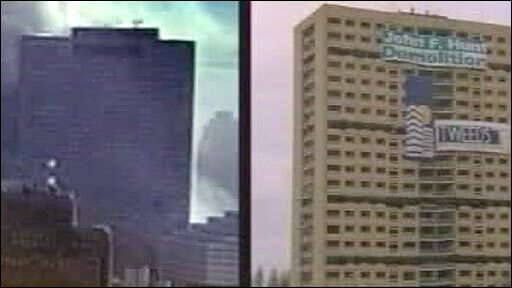 In 1991 a fire in the One Meridian Plaza skyscraper in Philadelphia burned for 18 hours and did not collapse. In 2005, a 32 storey building in Madrid burned for a whole day, there was a partial collapse, but the building remained standing. WTC7 burned for seven hours and suffered a total collapse. 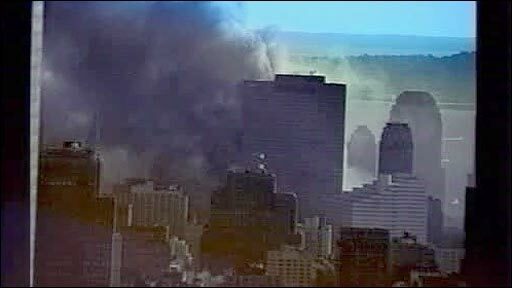 Fire protection engineers point out that the fires in Philadelphia and Madrid were fought, whereas in WTC 7 the fires burned without being fought, and the key sprinklers on the lower floors did not have any water because the mains had been cut by the collapse of the Twin Towers. Tower 7 was one of seven buildings at the World Trade Centre complex in New York. The skyscraper was 610ft (186m) tall and just 350ft (107m) away from the Twin Towers. As well as housing offices of leading financial companies, Tower 7 also had some unusual tenants: the Secret Service, the CIA, the Department of Defence and the Office of Emergency Management, which would coordinate any response to a disaster or a terrorist attack. "You have to look at what was inside Building 7. You had the largest CIA field office ... you had a number of government agencies inside the building. "So automatically, for a number of people, myself included, that is enough to at least raise an eyebrow." Some people argue that the US government had to demolish Tower 7 because it is where plans were hatched for a massive conspiracy on 9/11 and even that the hijacked planes were guided to their targets from Tower 7. Others believe the government also wanted to destroy key files held there about corporate fraud. After its collapse a CIA team is reported to have scoured the rubble looking for secret documents. "I was in the World Trade Centre 7 on a number of occasions. This was a commercial office building in downtown New York. The fact that there were some government agencies in there, is certainly true, but there were lots of other people in there too and you could have rented an office or floor anybody could have." AP report, 5 Nov 2001: "The official, speaking on condition of anonymity, said that immediately after the attack, a special CIA team scoured the rubble in search of secret documents and intelligence reports stored in the station, either on paper or in computers. It was not known whether the efforts were successful. "A CIA spokesman declined to comment on the existence of the office, which was first reported in Sunday's editions of The New York Times. The New York station was behind the false front of another federal organization, which the Times did not identify. "The station was a base of operations to spy on and recruit foreign diplomats stationed at the United Nations, while debriefing selected American business executives and others willing to talk to the CIA after returning from overseas. The agency's officers in New York often work undercover, posing as diplomats and business executives, among other things. They have been deeply involved in counter-terrorism efforts in the New York area, working jointly with the Federal Bureau of Investigation and other agencies." Official investigators for the National Institute of Standards and Technology (Nist) in Washington DC, say that what happened on 9/11 to World Trade Centre 7 was unique. Tower 7 was built over a subway and an electricity substation. There were only a few places where foundations could be put down and long beams were needed to take the weight of the building on the east side. The building had to be reinforced on the fifth to seventh floors, and also between the 22nd and 24th floors. Fires were ignited on many different floors at the same time. Crucially fire fighters could not fight the fires in Tower 7. They did not have enough water and focused instead on saving people caught up in the aftermath of the collapse of the Twin Towers. "Our working hypothesis now actually suggests that it was normal building fires that were growing and spreading throughout the multiple floors that may have caused the ultimate collapse of the buildings." Nist investigators have focused on the east side where the long floor spans were under most stress. They think fires burnt long enough to weaken and break many of the connections that held the steel structure together. "It turns out that when you have connections that essentially don't have strength for the loads that they are being subjected to. And you have this massive failure of a column it does not take time. The structure has lost all integrity at that point in time." Investigators think that eventually enough connections were weakened or failed that when a collapse started the whole building fell rapidly. According to the official account, when the North Tower collapsed at 10.28, WTC 7 was hit by some huge sections of steel from the collapsing Tower and this starts a chain of events that will ultimately lead to the collapse of Tower 7. "The fires weren't burning on all the floors simultaneously. They were scattered about on the floors. "And as they burn they're going to move through the building so they'll certainly heat up some of the steel in an area. But then as it moves on when it consumes the combustibles there, the chairs, desks, the tables, whatever papers were there. Then there's no longer any source of heat." In the National Institute of Standards and Technology (Nist) interim report issued in 2004 investigators explain that they used photographs and video evidence to determine fire locations and movement within WTC 7. 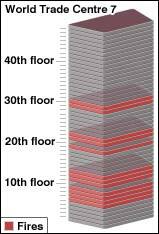 Nist determined that there were fires on floors six through to 13 - except floor 10. And also on floors 19, 21, 22, 29 and 30. Critics of the official report have concentrated on the west, north and east sides of the building, where the fires did not seem severe. However, new testimony and pictures show how the south side was engulfed in smoke. Members of the New York Fire Department who were on the scene at the time told The Conspiracy Files that the building was heavily involved in fire. "We looked at it and said there's so much fire in this building, nobody's going to put this fire out". Photographer Steve Spak, who took some of the clearest images of the damage to Tower 7, told the BBC there was smoke on a lot of floors on the south side of the building and numerous floors had fires. "Through my experience of taking fire photography for the last 30 years, to me that's an indication of extremely heavy fire condition and a dangerous fire condition." 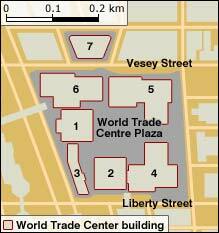 The National Institute of Standards and Technology (Nist) investigation into the collapse of the World Trade Centre buildings began on 21 August, 2002. The final report on the collapses of the Twin Towers was issued on 26 October, 2005. Nist say the investigation into the collapse of Tower 7 will be completed in 2008. Nist's draft report is due to be published in July and the final report is due to be released in August. However, critics say the report has been too long coming. Some have even suggested the way official bodies have investigated Tower 7's collapse makes it looks like they are hiding something. The first inquiry into Tower 7 by the Federal Emergency Management Agency, or Fema, said the building collapsed because intense fires burned for hours, fed by thousands of gallons of diesel stored in the building. But it also said this had "only a low probability of occurrence" and more work was needed. Critics point out that was six years ago. "We've been at this for a little over two years and doing a two or two and a half year investigation is not at all unusual. That's the same kind of time frame that takes place when we do aeroplane crash investigations, it takes a few years." "Nist has seen no evidence that the collapse of WTC 7 was caused by bombs, missiles, or controlled demolition." However, critics of the official account claim the collapse of World Trade Centre 7 was a controlled demolition. "Building 7 is the smoking gun of 9/11. It is the most obvious example of controlled demolition with explosives." "I saw this building which had never been hit by a plane come crashing straight down. I must admit I was taken aback as a physicist looking at this. We've all seen controlled demolitions I think. They proceed rapidly and straight down. But that's with explosives." "That is a controlled demolition... absolutely. It's been imploded. It's a hired job done by a team of experts." But most controlled experts disagree. Mark Loizeaux who runs one of the world's leading demolition companies, Controlled Demolition Incorporated, and who holds the world record for bringing down the largest steel structure, the J L Hudson building in Detroit, says it is simply not possible to bring down a building like Tower 7 which was fully occupied and without anybody seeing or hearing something. "It's noisy. There's just no way to get around it. You go in, you knock out usually all the walls on the floors where you place explosives, gut them." Mr Loizeaux also told the BBC that you would need to place hundreds of explosive charges along with miles of initiating cable and miles more detonating cord. And you would find evidence left behind of all these explosive charges, blasting caps and tubes. Furthermore says Loizeaux, when you are dealing with charges big enough to bring down a building like Tower 7: "The amount of air that's displaced will break windows easily. "There were a lot of broken windows mainly through impact debris. But I didn't see windows broken on the backs of building, only where debris falling from the Towers struck it. "But come round the back side, no windows were broken there. "They were shielded from debris falling. If explosives of the magnitude necessary to cut the columns in a big building, were detonated the windows all the way round would have been shattered. No way round it." Dr Gene Corley, the lead investigator for the first inquiry by the Federal Emergency Management Agency (Fema) told the BBC: "We looked at everything. "Controlled demolition was ruled out because there was no evidence of controlled demolition ... we looked for it, yes, and we found no evidence of controlled demolition." A number of people from the Fema investigation helped out immediately after the attacks, and shortly afterwards other team members began arriving to begin their investigation. Every inch of the site was picked over by hundreds of people. No one reported any signs of explosives. Critics of the official account believe they have found evidence of the unconventional demolition of Tower 7 using a substance called thermite. Thermite is a substance that can literally melt steel and is made up of iron oxide and aluminium. Sceptics base their claims for this on an analysis of the dust from the World Trade Centre site after the attacks. In this dust they have found tiny iron rich spheres. These spheres can only be formed in very high temperatures - temperatures higher than those reached in the fires in the towers before their collapse. The former professor of physics, Steven Jones, believes the spheres he has found in the dust from the World Trade Centre site match the spheres you get in a thermite reaction. He argues that thermite is the explanation for the presence of iron and aluminium in the spheres. However, other scientists say there are other explanations for presence of these tiny iron rich spheres. They could have come from the cutting torches used after 9/11 to clear the site, from any building work on the site before the attacks or even from the collapse of the Towers themselves. The demolition contractor, Mark Loizeaux says the timing of when the explosions on the columns are set off is critical. He cannot see how thermite or any derivative of thermite could have been used to deliberately demolish Tower 7. "I've never seen anyone use a material, which melts steel for demolition purposes. I don't see how you could possibly get all of the columns to melt through at the same time." People who think thermite was used to demolish Tower 7 have also claimed that the one section of steel from the building that was kept reveals that it was melted by some strange substance. The half inch (1.3cm) steel beam has been entirely dissolved in parts. The New York Times described this as "perhaps the deepest mystery uncovered in the investigation." "I don't find it very mysterious at all, that if I have steel in this sort of a high temperature atmosphere that's rich in oxygen and sulphur this would be the kind of result I would expect." The allegation is that the owner of Tower 7, Larry Silverstein, was part of a conspiracy to demolish his own building. It stems from a documentary broadcast in September 2002 called America Rebuilds which documented the post 9/11 World Trade Centre site clean up. In an interview Larry Silverstein said: "I remember getting a call from the fire department commander, telling me that they were not sure they were gonna be able to contain the fire, and I said, 'We've had such terrible loss of life, maybe the smartest thing to do is pull it.' And they made that decision to pull and we watched the building collapse." Critics say that by using the phrase "pull it" Larry Silverstein let slip the fact that he was involved in a decision to bring the building down. They point out that Silverstein took out a $3.5bn (£1.75bn) insurance policy on the Twin Towers just two months before the attacks. A policy that was to pay out in the event of a terrorist attack. However, without this policy Larry Silverstein would not have been able to buy the buildings, and the insurance was not just for terrorism. This policy did not include Tower 7. The insurance on Tower 7 dated from 1987, when it was built. "In the afternoon of September 11, Mr Silverstein spoke to the Fire Department Commander on site at Seven World Trade Centre. "The Commander told Mr Silverstein that there were several fire fighters in the building working to contain the fires. "Mr Silverstein expressed his view that the most important thing was to protect the safety of those fire fighters, including, if necessary, to have them withdraw from the building. "Later in the day, the Fire Commander ordered his fire fighters out of the building and at 5:20pm the building collapsed. No lives were lost at 7 World Trade Centre on September 11, 2001. "As noted above, when Mr Silverstein was recounting these events for a television documentary he stated, 'I said, you know, we've had such terrible loss of life. Maybe the smartest thing to do is to pull it.' Mr McQuillan has stated that by 'it', Mr Silverstein meant the contingent of fire fighters remaining in the building." Chief of the New York Fire Department on the day Daniel Nigro told The Conspiracy Files that the fire service does not need to ask the permission of the owner when making decisions relating to buildings that are on fire: "We are in charge and the decision will be the fire chiefs and his alone," he said. Are the media part of a conspiracy? It is alleged that it was not just the government, the police and the fire department that conspired to destroy Tower 7. People have also pointed the finger at the media. Both CNN and the BBC reported that Tower 7 was about to collapse or had collapsed when in fact it was still standing. Some have even suggested this shows the media were handed scripts by the conspirators. "The investigations we've carried out suggest very strongly that we were working on the basis of an incorrect news agency report." "On September 11, 2001, Reuters incorrectly reported that one of the buildings at the New York World Trade Centre, 7WTC, had collapsed before it actually did. The report was picked up from a local news story and was withdrawn as soon as it emerged that the building had not fallen." The BBC correspondent at the centre of the controversy, Jane Standley, has never talked about this before. She told The Conspiracy Files that she had just arrived in New York. She had never heard of Tower 7, and did not recognise it in the New York skyline. On the day she had precious little information available. "It's very unfortunate," she said "that this whole conspiracy kind of I think rather ridiculous situation has grown out of what's really a very small and very honest mistake." There is no evidence that anyone died in Tower 7 on 9/11. However, conspiracy talk shows and websites seized on a recent interview for Loose Change with the crucial eyewitness Barry Jennings. The writer and director of Loose Change, Dylan Avery, told The Conspiracy Files: "The amount of detail that Barry gave us in this interview was unreal. He says he was stepping over dead bodies in the lobby." Barry Jennings himself disagrees with their interpretation of his words. Barry Jennings told the BBC: "I didn't like the way you know I was portrayed. They portrayed me as seeing dead bodies. I never saw dead bodies"
Dylan Avery is adamant that he didn't take anything out of context. He played The Conspiracy Files a recording of Barry Jennings words: "The fire fighter who took us down kept saying do not look down. And I kept saying why. "He said do not look down. And we're stepping over people and you know you could feel when you're stepping over people." However, Barry Jennings told the BBC: "I said it felt like I was stepping over them but I never saw any. "And you know that's the way they portrayed me and I didn't appreciate that so I told them to pull my interview." The Conspiracy Files: 9/11 - The Third Tower was broadcast on Sunday 6 July, 2008 at 2100 BST on BBC Two. It will be repeated on Tuesday, 8 July at 2320 BST on BBC Two and on Wednesday, 9 July at 0130 BST on BBC One. You can watch a preview clip by clicking here.